In today’s technical world there seems to be something that can do this and something that can do that. Often it’s a great idea or concept that could be useful but every now and then the function itself gets lost in the technology. Or as in the case of the Caddy Track Pro app, the idea is simple enough and comes in a user friendly package. Everyone has a preferred app or piece of software that can track stats for their golf game so is this particular app different from all the rest or does it get lost in the technological shuffle? Check it out. When I test apps the first things I look for are design, features, presentation, and user friendliness. Well this app has all of the above. The layout of the app is simple to understand and use which was nice to see since some apps try to give you everything you need but kill you with information overload. The Caddy Track Pro gives you what you need in a no frills kind of way. This makes the app very appealing to golfers of all skill levels, especially those who may be wanting to track their stats for the first time but don’t want paralysis by analysis. Caddy Track Pro has the ability to track the distances for all your favorite clubs in a neat little sliding menu that takes you from driver all the way down to gap wedge. Well, almost all of your favorite clubs. Something I thought was lacking about the app was the fact that it’s missing clubs that are found in increasingly more and more golf bags, the hybrid and the lob wedge. Hopefully these omissions are fixed in a future update because I think this is a must have for golfers. The 2 iron option isn’t as popular as what a hybrid or lob wedge option should be for the majority of golfers. Testing this app boiled down to ‘how easy was it to measure the distance of your shot?’ and then ‘how easy was it to upload the data?’ Both were very easy actually. All you do to start is toggle the GPS position to ‘on’, then you go hit your shot (hopefully it goes straight! ), press ‘begin shot’ and then go out to your ball all the way out in the fairway (right?). 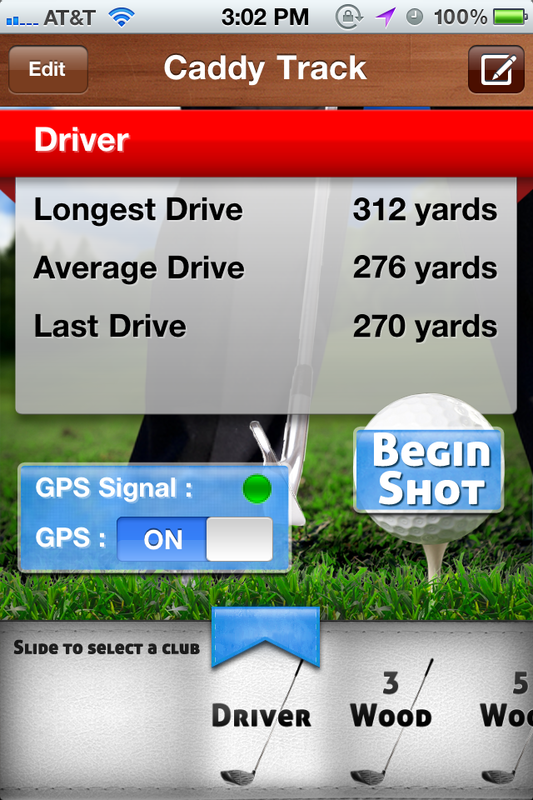 Once there you press ‘measure shot’ and the distance data is automatically recorded under the club you selected. It really is that easy. A cool feature with the Caddy Track Pro is that it acquires the GPS signal almost immediately after you switch it on. Turning it off will save your battery a bit but don’t forget to turn it back on! This is where the app falls short to other GPS or range finder devices where the battery may last longer with those devices. With all of these kind of devices and apps, they’re at the mercy of the amount of charge that’s left on them but phone batteries traditionally don’t last as long as bigger devices that have the bigger batteries so mind that charge. Another cool feature with the GPS functionality is that the app will also display an alert asking you if you’d like to continue using the app or if you’d like to turn it off. I think that’s a great way to help conserve battery life and I’ like to see other apps follow suit as well. Finally, you’re able to email your stats to yourself or anyone else for that matter with a quick press of a button. Everyone knows that you are crushing your 7 iron but can’t hit your driver as far as said 7 iron. Well maybe that’s not a cool feature for you if that’s the case but you know what I mean. It’s great to share stats like that which can be used for future analysis down the road. Even with not having a hybrid or lob wedge to select from the club library, this app is handy enough for someone who hasn’t embraced complete stat tracking yet but is wanting to stick their toe into the stat tracking pool. The Caddy Track Pro retails for $3.99 and is available for iPhone and iPad only at this time. Always wanted to track your stats but didn’t know where to start or don’t want to pay premium dollar for an app? Check out the Caddy Track Pro app and see if it helps you determine how far you’re really hitting your clubs which will help with club selections in the future as well as some lowering of those scores of yours. Good write up Todd, I will keep this one in mind for when they develop it for the droids. Looks good except as you said about the hybrids and lob wedge, that would not be a deal breaker for me. Pretty awesome review Hanks! Sounds like it’s affordable, easy to use, and has some nice features. Unfortunately, not everyone has an iPhone. Very solid buddy! Nice review Todd! Seems easy enough to use and priced extremely well. As mentioned, I would be a bit concerned with battery life and forgetting to turn off/on. I just wonder how many golfers would use this simultaneously in addition to another device or program that is giving us our yardages to the hole, etc. Great review Hanks. Really liked that write-up, gave a clear view of the features and makes this app sound like a useful tool for those wanting some simple-to-follow stats on their game! Battery life really is a limiting factor on these apps though, which is a shame. But for this price, this sounds pretty cool. I’d take a look at a droid version of this. Nice job Hanks.Still on the fence about this one. Thanks for all the info. Great review Hanks! I think I might have to download this for casual playing days. I use a scorecard tracker app now, but I have always wanted a club distance feature to it. Thanks for the awesome review. Nice review! Had never heard of this app, and had actually been looking for something similar for my iPhone. Seems as if it’s very user friendly, and at $3.99 why not try it out? DawgDaddy – there is a similar app for Android. 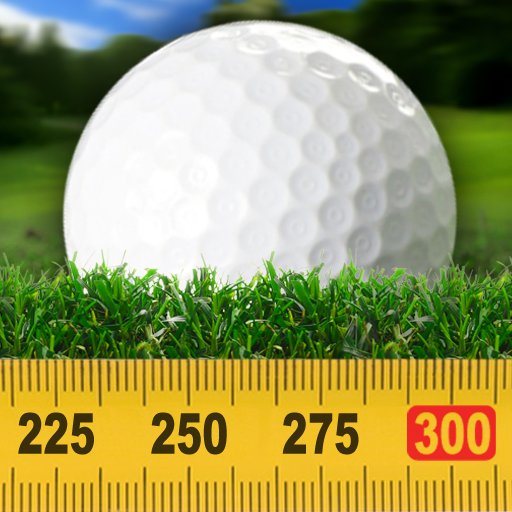 Search for ‘Golf shot tracker’ in the android market. Well done on this, Todd. For the price, this looks like a handy little app to have. Pretty cool app, and a good review of it buddy. You said a 2 iron was available, so I suppose until they add a hybrid, you could use that to track it…unless you are carryin a 2 iron too. Great stuff hanks. I have just a few free apps on my iphone but I may have to check this one out. Thank you! Nice review Hanks! Seems real simple to use and I’d say the price isn’t too bad at all. Not having hybrids listed though is a bit strange, but I just might have to check this one out. With so many options out there it’s good to see THP reviewing some good apps. Maybe a round-up of new apps and old faithfuls sometime? I currently use GolfCard Pro for tracking stats and GPS (love the ability to GPS a course myself, before I go to a new course!) and GolfShot when the course is not in GolfCard. I love being able to track my shot distance (on all my clubs) as well as my scores with GolfCard Pro as well as know distances to hazards, front/back of greens, dog legs, etc. Great info,Hank. I need to check into this once it comes to the Droid market. I already have the Scorecard and it works great. Nice review Hanks, I many need to check this one out. I’m with you, the omission of hybrids is a kind of strange considering their popularity at the moment. Nice job Todd. Too bad I have the droid, hope they get that version out soon. Nice review T, I see so many people getting more involved in tracking stats so this thing is definitely going to be big as it sounds like it is one of the better ones. Too bad it’s not available on the Android Market yet, once it is I’ll check it out. Thanks! Nice review. How did the download/upload of the data work? Is it a CSV file? Nice write up, sounds interesting. But I have one question, what if you dont drive directly to your ball. Does it track the distance traveled in the cart or from point A to B? Nice review Todd! For $3.99 I may have to get this for my iPhone! Thanks again! Nice review, Hanks. I’m sure if it sells a bunch it’ll find it’s way to the Android market as well. Good job of providing a description of the app. But the most important thing missing in the review is the answer to the critical question of whether or not the yardages given are reasonably accurate. I bought the app based on the description, but found that at least on my 3GS iPhone, that the yardages were way off, and that measuring a known reference distance ten times gave me ten different, significantly varied readings, even though the app indicated the GPS signal was adequate. Nice job Hanks, this sounds like a great app to measure distances. I hadn’t thought about it, but Mohdds brings up a great point, are the yardages accurate? Michael Cook also made a good point in the fact that other apps (although some are much more expensive) offer GPS to give distance from the hole, as well as the ability to track yardage. It seems like this is a good app for the price though, especially if you have a range finder or laser. I loved the line “paralysis by analysis”! Hilarious. May check it out. Could be more reliable than using my laser for tee shot yardage.